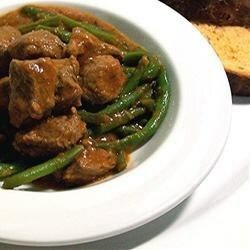 "This recipe is great made with either fresh or frozen green beans. If you use frozen use the French style beans. This is Greek stew that my mom always made while I was growing up and has now been handed down to my children. Enjoy!" Heat oil in a large pot over medium heat. Saute onion and celery until golden. Stir in lamb, and cook until evenly brown. Stir in tomato sauce and water. Reduce heat, and simmer for about 1 hour. Stir in green beans. Season with parsley, mint, dill, cinnamon, sugar, salt and pepper. Continue cooking until beans are tender. This is a wonderful way to cook lamb. We love to make it in the winter - thank you!